WESTFORD, MA. April 18, 2016 –– Tyco Security Products has introduced the 4.8.1 version of American Dynamics victor Video Management System (VMS) and VideoEdge intelligent network video recorders (NVR), which includes new features to simplify administration and speed security investigations. The newest version of victor gives video management system operators the ability to schedule video clip retrieval for a later time during off-peak network usage hours to improve bandwidth management. Additionally, incident builder allows users to correlate video evidence for a complete event presentation. To reduce post-event investigation time, operators and guards now can create bookmarks along with notes when something of interest has been observed. Notes, images and other documents can be added to a single file along with clips that have been stitched together for succinct video evidence of an event. Further, users can check authenticity of the exported evidence presentation with the new digital authentication capability providing a simple way to prove secure evidence that can be upheld by law enforcement. With the new Unified version of victor, administrators now have the ability to update user roles and privileges for Software House C•CURE 9000 systems including the C•CURE 9000 monitoring station, administration workstation and C•CURE Go mobile app. 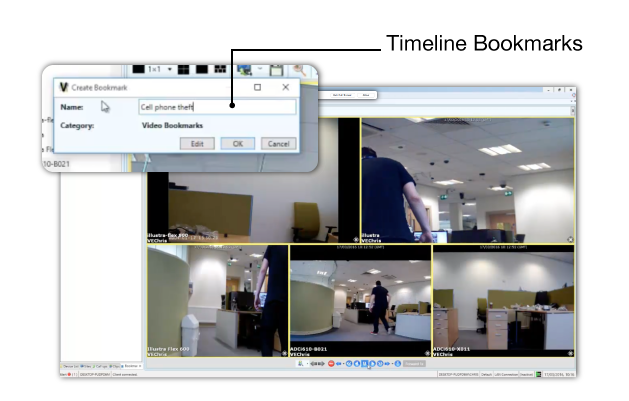 This synchronization consolidates an operator’s setup, saving time and unifying video security and access control. This release also offers operators the option to import fully functional C•CURE 9000 maps into victor. Security operators can lock and unlock the door or open a door with a swipe and show interface directly from the victor map. For retail settings, victor 4.8.1 enhances the point-of-sales display to show receipt data alongside the corresponding video for instant visual verification and simplified monitoring of fraud and theft. For more information about the victor Video Management System and our comprehensive line of Video Surveillance Solutions, visit americandynamics.net.